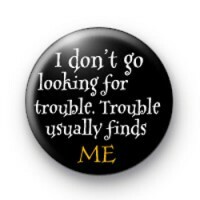 I don't go looking for trouble. Trouble usually finds me. Harry Potter quote. Books are written by British author J. K. Rowling. Wizards Hogwarts Voldemort Hermione Granger, and Ron Weasley.